SIGMARAIL® shows covers at its best. NEW! SIGMARAIL® now also for your most beautiful DVDs! The Rack-System with noble elegance! 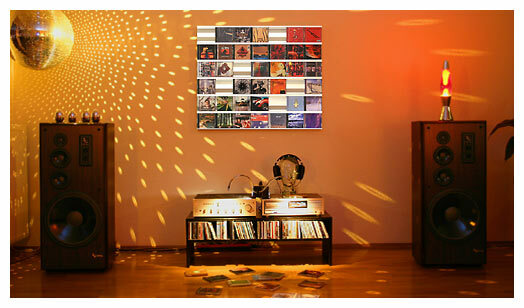 The covers of your favourite CDs, DVDs or Blu-rays are much too beautiful to hide in conventional racks. Open your DVD treasury and display your favourite DVDs – with SIGMARAIL®, the beautiful and timeless rack system made of aluminium. The SIGMARAIL® CD holder finishes piling your CDs on top of each other and lengthy searches after your precious CDs. According to the patented design, each CD can easily be inserted or removed with just one hand. You can order your SIGMARAIL® design rack with just a few clicks directly in our online shop! Buy without any risk: If you are not satisfied, you will receive a full refund! Allow our friendly customer-service to convince you! Customer feedback: "Excellent product!!! Very good & friendly service! Swift as an arrow!" "Form follows Function" is the slogan of Mike Büchert, founder of LOWKON object design from Stuttgart in Swabia, Germany. He supports a design adapting itself to the elegant and classic simplicity of the Bauhaus style. Customer feedback: "perfect service, perfect design, perfect workmanship 1+"